There are three principal reasons for using the transpublishing method and transquotation. The first two of these are available immediately. This system offers a unique permission to recomposite and republish; THERE HAS EXISTED NO LEGAL METHOD FOR GENERALIZED LARGE-SCALE RE-USE OF COPYRIGHTED MATERIAL. (A lack of a legal method has not been felt specifically, just as we usually do not feel the lack of new inventions till they exist. This new system of availability has a number of special advantages. • Anyone may quote in any quantity without negotiation or prepayment. • Publishers benefit, since they can spread (and possibly sell) their material more widely. 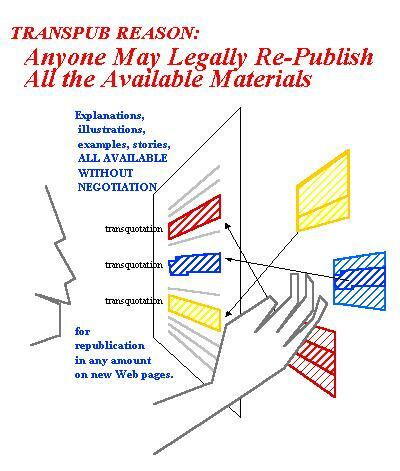 • The public benefits, by being able to re-publish copyrighted material without red tape. A connection is kept to the transprovider's original context. 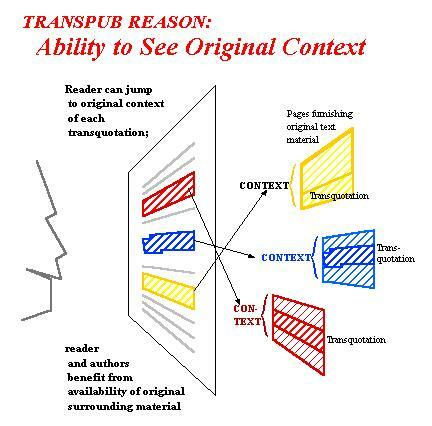 No transquotation is out of context, since the original context is immediately available to the reader. In an important extension to the system, publishers will be able to collect a small payment for each downloaded portion, if the user is willing. 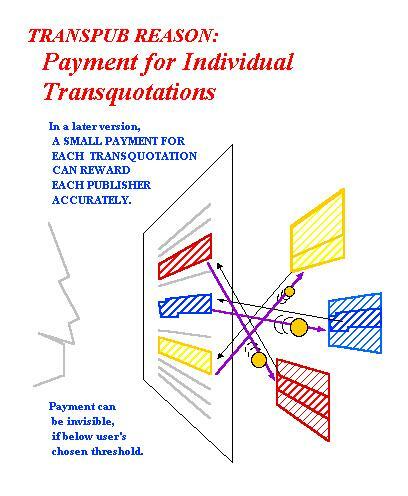 • If a suitable micropayment system is attached to the materials, payment is made from each downloader to the original publisher for the exact portion of the quote, so the original publisher is paid in precise proportion to usage.